So, I have a question. How many of you have seen the new Netflix special called “Nanette” – a stand up comedy special by an Australian woman named Hannah Gadsby? If you haven’t seen it, make the time. It’s hilarious. It’s also a heartbreaking, empowering, fierce commentary on the state of our world, especially around gender and sexuality. Hannah’s story magnifies the Holy, as our psalmist says. I watched it twice and seriously considered sharing it whole as a two week “sermon” series. We live in a moment in history and in a state where there is SO MUCH to celebrate about LGBTQ equality. And yet, I resonate with this quote so much. I’m out as queer in all of my on-going relationships, personal and professional. I have been out for over half my life now. And yet, there are still moments when I feel haunted by shame. I generally try to avoid those parts of my story, though. They are embarrassing. I’m supposed to be all comfy cozy in queerness, by now, I tell myself – especially in public as a professional. But I want to learn from the shame. Because unless I learn from it, I like Hannah, will get stuck in it. 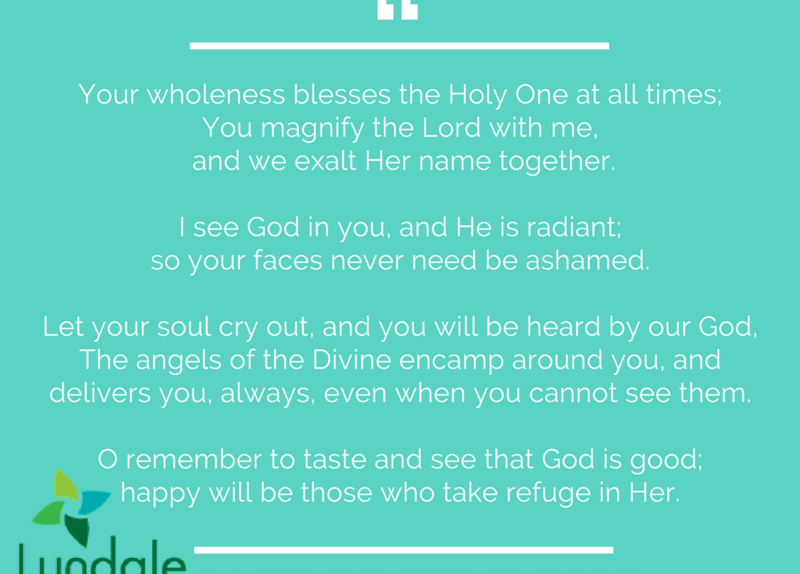 And when we are stuck in shame, it is so hard to bless and praise the Holy, to let our lives magnify the Love of God, to look God in the face and be radiant, as our psalmist says. In fact, our psalmist promises that when we look God in the face, we will never be ashamed. We cannot feel God and shame at the same time. And I so want to feel God. So I’m inviting you into a part of my shame story that happened just this past week. I don’t usually preach on my own stuff until there is scar tissue that reflects some processing, time and healing. But this week, I’m inviting you in to bear witness because I need some help to wrestle a blessing from the forces of oppression and shame. And I hope that in my story, you will glimpse some of your own story. After all, shame has become a far too common experience in our culture, at least as professor of social work Brene Brown defines it. She calls shame “the intensely painful feeling or experience of believing that we are flawed and therefore unworthy of love and belonging – something we’ve experienced, done, or failed to do makes us unworthy of connection.” I’m going to read that again ——. You don’t have to raise your hands this time, but how many of you have felt that? On Thursday morning, I sat in a Hennepin County Courtroom answering questions about my fitness to adopt my own child. In other words, I sat right in the middle of heterosexism and homophobia’s lie about my life and my family. When Minnesota passed marriage equality, there was a concession around parenting rights. The story of queer love won the day. But the story of queer family, of queer parents and children of queer parents, took a hidden loss. Though I have been married to my wife for 6 years and we have been together almost 10 years, the child she gestated in her body was not my child legally until we went through an adoption process. I spent the last 8 months since our baby was born submitting character references, undergoing a multi-state criminal background check and paying significant money to cover the fees of an attorney with a grand finale of sitting in court last Thursday with my little family to testify to my fitness for legal motherhood of my child. That’s the state-sanctioned lie that breeds my shame: that queer families are not real families, that we are not worthy of legal support because we are somehow unfit, that we are in fact dangerous to children’s well-being until proven otherwise. I have blocked the exact questions the lawyer and the judge asked my wife and then me in court during our testimonies. But the questions to my wife were generally about if it would be in the best interest of the baby for me to be her legal parent. The questions for me were about my own ability to make such a significant decision, if I had a criminal history, and if I was sure I wanted the responsibility of legal motherhood and all the financial obligations with which it might come. I held back shame’s tears as I answered in simple yeses and nos, as instructed by our attorney. After about 15 minutes, the judge granted me legal parenthood. And then he invited us to celebrate by taking a picture with him. I didn’t feel like celebrating. I felt relieved the process was finally over. I felt grateful for the foremothers who pushed our legal system this far so that I could have any legal rights to our child – a source of security denied to queer parents until relatively recently. But celebrate? We took the picture with fake smiles, not the kind that magnify the gifts of joy that arise from the holy. Shame makes it really hard to search out God. I went looking in capitalism’s temples – boutiques and nail salons – all between church meetings, mind you. I found this dress! But they didn’t deliver me from shame. I just kept feeling haunted by the court’s questions. They were treated as pro-forma, but their power over my family’s future was real. And I realized that I had internalized the message they sent me: that I wasn’t really my own baby’s mom, that I was a possible threat to her, that I may not be fit for motherhood. In other words, unworthy, unworthy, unworthy of love and belonging in my own family. How do we break out of the lies shame teaches us? How do we move back into the posture of blessing our psalmist teaches? For me this week, it took being blessed myself. And, as it happens, being blessed by some of you. That might be the best definition of good church I’ve ever read – a place for wholeness without shame, a place of refuge from everything in the world and in ourselves that is not genuine. Or one might say, a refuge from everything that does not magnify the image of God that lives inside us. This is anti-shame medicine. On Thursday night, I had a Thrive fundraising team meeting here at Lyndale with some of you that was exactly this kind of medicine. This is not the kind of meeting that outsiders might think of as a blessing. But truly I tell you, these gathered church ladies were like the angels of God from our psalm encamping around me. I didn’t know it until you all looked at pictures of my baby with gasps of delight and listened as I told the abbreviated story of the court hearing that day with gasps of horror so genuine I believed you. And in believing you, I began to believe myself again. And in believing myself again, I began to magnify the image of God inside me again. You were a living blessing, reminding me who I am. Shame didn’t magically disappear by the end of that meeting. I have been struggling against it all weekend. It’s something that I experience as “in remission” most days, but it will never be cured for me until liberation is more real for all of us than the isms whose lies are so loud. and we exalt Her name together. so your faces never need be ashamed. around you, and delivers you, always even when you cannot see them. happy will those who take refuge in Her. Wow. Thank you for opening us up to your experience. I had no idea this was still standard procedure in our state. I am relieved for you and also enraged. Thank you for this powerful message, accompanied by the coos and sounds of the beautiful girl herself. 🙂 Sending lots of love to your whole family.